Kate Braid worked as a receptionist, secretary, child care worker and lumber piler before stumbling (literally) into construction. For fifteen years she worked as a labourer, apprentice and journey carpenter building houses, high rises and bridges and doing renovations as a non-union, union and self-employed carpenter. Her passion was concrete. During her early years in construction, with no other women to talk to, she began talking instead to her journals, keeping copious notes to try and understand the very male culture of construction (“Why are they acting like this? Why am I?”) Eventually as the working days grew longer and her lines shorter, she realized she was writing poetry. This led to her first book, Covering Rough Ground, which won the Pat Lowther Award for best book of poetry by a Canadian woman. Much of her comfort in those early days came from sitting in art galleries, keeping company with the paintings of Emily Carr and later, reading Emily’s books. Emily too, had to struggle to continue to do what she loved. This led to Kate’s second poetry book, To This Cedar Fountain, nominated for the BC Poetry prize. 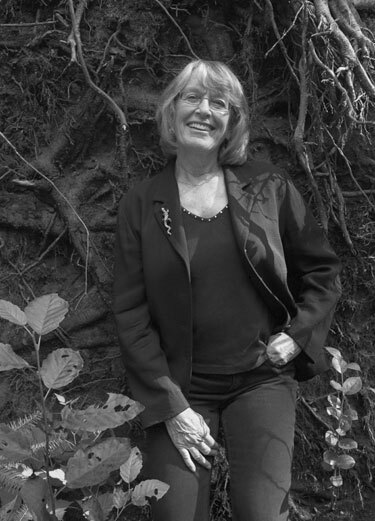 Toward the end of writing that book, when she discovered Emily had once met Georgia O’Keeffe, she launched into a third book of poems, Inward to the Bones: Georgia O’Keeffe’s Journey with Emily Carr which was nominated for several prizes and won the Vancity Book Award. Later, a chance encounter with an impressive trade unionist and story teller, Al King, led to her collaboration with him in writing his memoir, Red Bait! Struggles of a Mine Mill Local. After leaving construction in 1995, she taught creative writing at the University of British Columbia, Simon Fraser University and for ten years at Malaspina University-College (now Vancouver Island University). The students in one of her creative non-fiction courses did such a fine job of interviewing local fishermen and women that their stories were published as The Fish Come In Dancing: Stories from the West-Coast Fishery, with Kate as editor. When she became interested in the challenges and pleasures of formal poetry (such as sonnets, ghazals and glosas), she began teaching metre and form to her students. The results were impressive but the difficulty of finding a text that included any Canadian material, led to her co-editing with Sandy Shreve the first Canadian book of form poetry, In Fine Form. In 2002, sudden hearing loss in one ear led her to Bach and to Glenn Gould, and to writing A Well-Mannered Storm: The Glenn Gould Poems. A second book of poems about her experiences in construction, Turning Left to the Ladies, was published by Palimpsest in June 2009. Kate’s prose memoir of her fifteen years in construction, Journeywoman: Swinging a Hammer in a Man’s World was published by Caitlin Press in 2012. She is now working on a second edition of In Fine Form with Sandy Shreve to be published in 2016 (also by Caitlin), and a book of essays. A new and revised edition of her first book, Covering Rough Ground, now called Rough Ground Revisited, has been published by Caitlin Press. Kate has taught non-credit writing courses in writing workshops across Canada and her essays and poems have been widely anthologized and reprinted. In 2012, she was writer-in-residence at Mabel Dodge Luhan House in Taos, New Mexico and in the same year, was declared one of Vancouver’s Remarkable Women of the Arts by the Vancouver Board of Parks and Recreation. In November 2015 she was awarded the Vancouver Mayor’s Arts Award for the Literary Arts, for showing “leadership and support for Vancouver’s cultural community over the course of her career” and for “signficant contribution” to the Literary Arts in Vancouver. She continues to give talks and readings on issues of women entering the trades.